BlueScope Steel aspires to achieve zero dam water use So THAT operations do not draw on limited community water supplies. For many of the communities in which we operate, the shortage of drinking water is a significant, long term issue. BlueScope Steel aspires to achieve zero dam water use so that operations do not draw on limited community water supplies. To achieve this, the Company requires that water efficiency is considered during the design of new facilities. It also means that existing operations investigate water efficiency opportunities and explore alternate sources such as recycled water. A range of successful water savings initiatives at BlueScope have already been undertaken to reduce water consumption and reliance on community supplies. The Company is continuing improvement activities toward this aspiration. 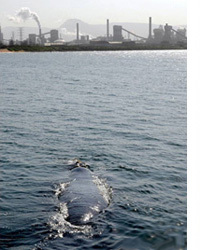 Southern right whale surfaces in Port Kembla harbour, with the Steelworks in the background. Illawarra Mercury. Process disturbances have the potential to lead to emissions to water. BlueScope Steel has been reducing the number of process disturbances leading to emissions to water, as well as the extent of emissions when process disturbances do occur. The Company aspires to extend this record of improvement and to eliminate all emissions to water from process disturbances. Water is a precious commodity. 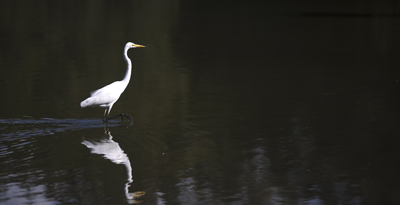 Many of BlueScope Steel’s operations are located adjacent to significant water bodies. These water bodies are not only used by humans for domestic, recreational and industrial purposes, but are home to a myriad flora and fauna. The abundance of marine life that has returned to Port Kembla Harbour over the past decade is a testament to the Company’s focus on continually reducing emissions to water. BlueScope Steel aspires to reduce all types of emissions to water. The Company monitors water consumption and emissions to identify performance improvement opportunities, understand community impact, and to maintain regulatory compliance. Significant reductions in water consumption have been achieved in operations located in areas where water shortages are an ongoing issue. Although the iron and steel manufacturing process is unavoidably water intensive, BlueScope has identified and applied water recycling programs in parallel with water savings initiatives to reduce fresh water use. A variety of control mechanisms to reduce water emissions have been installed throughout BlueScope’s operational facilities. The Company operates a multitude of water treatment plants so that discharge water does not have an adverse effect on the environment. It also monitors and studies the steel manufacturing processes to maintain quality and minimise disruptions so water treatment plants can operate effectively and continuously. The key performance indicator used by BlueScope Steel to measure the water intensity of its operations is fresh water consumed per tonne of raw steel produced. This key measure has been substantially improved over time. In FY2003 the company used 3.7 kilolitres of water per tonne of steel. In FY2011, the result was 1.9 kilolitres per tonne of steel, an improvement of over 48 per cent. At our largest steelmaking facility, Port Kembla Steelworks in New South Wales, Australia, the great majority of water used is seawater, displacing the need to use precious fresh water for much of the site’s cooling requirements. 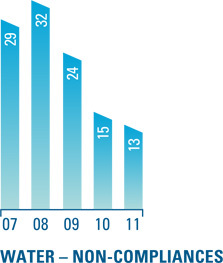 Since FY2007, the steelworks has also been using recycled water supplied by Sydney Water. Waste water received by Sydney Water from across the Illawarra region is treated and then re-used at the Steelworks. 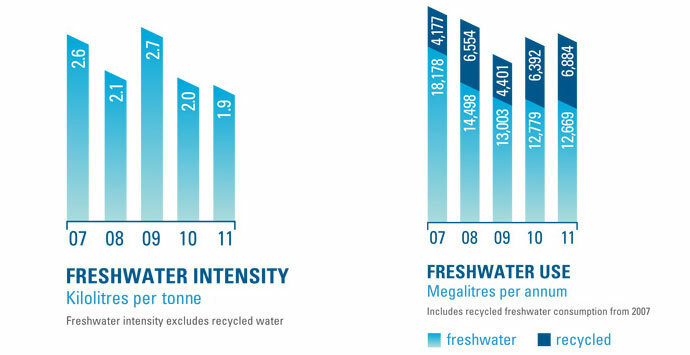 The use of recycled water has saved more than 28 billion litres of fresh water to date. Through diligent operational management and engineering, BlueScope Steel has successfully reduced the number of non-compliances relating to water by more than 50 per cent over the last four years. An incident which occurred in May 2011 resulted in a fine of $1500 issued by the regulator in August 2011. The incident related to a discharge of process water into a drain and then to Port Kembla Harbour, with exceedances of concentration limits for ammonia.